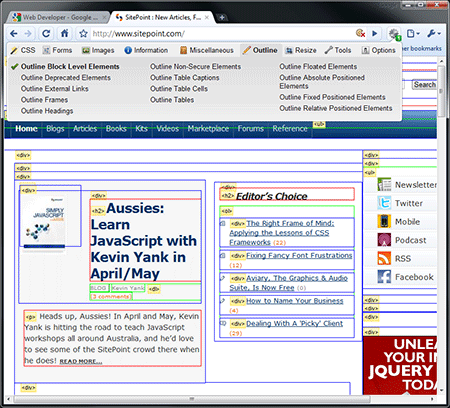 Chris Pederick’s Web Developer toolbar was one of the first extensions developed for Firefox. Personally, I think it was one of the primary reasons many developers switched to and evangelized Mozilla’s browser. I remember trying the WDT for the first time and reveling in its immense power. If you’ve started web developing during the past five years, you’d have been appalled by the poor quality client-side coding tools available initially — features such as element outlining, dynamic CSS editing, and cookie inspection were difficult, if not impossible. Although Firebug and similar developer consoles have taken the world by storm, they were influenced by many of the features and concepts Chris devised. The WDT remains one of my essential Firefox add-ins and the great news is that it’s been ported to Google Chrome. That said, WDT on Chrome is a fantastic addition to the browser. If you’ve recently switched from Firefox and miss some of its better tools, do yourself a favor and install the Web Developer toolbar today. 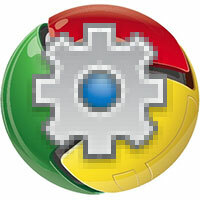 Do you use the Web Developer extension on Chrome or Firefox? What do you like? How would you improve it?